– Dr. Derrick Gibbings, Associate Professor in the Department of Cellular Molecular Medicine. A major research area in Dr. Derrick Gibbing’s lab is the cellular and molecular processes that cause Amyotrophic Lateral Sclerosis (ALS), a disease that gradually leads to paralysis because the brain can longer communicate with the muscles of the body. There is currently no cure, but new research coming out of the Gibbings lab is bringing us closer. Currently, over 15 genes are linked to ALS. Mutations in these genes have been shown to cause the disease, and usually lead to death within two to five years of being diagnosed. Scientists know that these gene mutations cause the disease, but exactly how is unclear and needs to be answered in order to develop treatment. 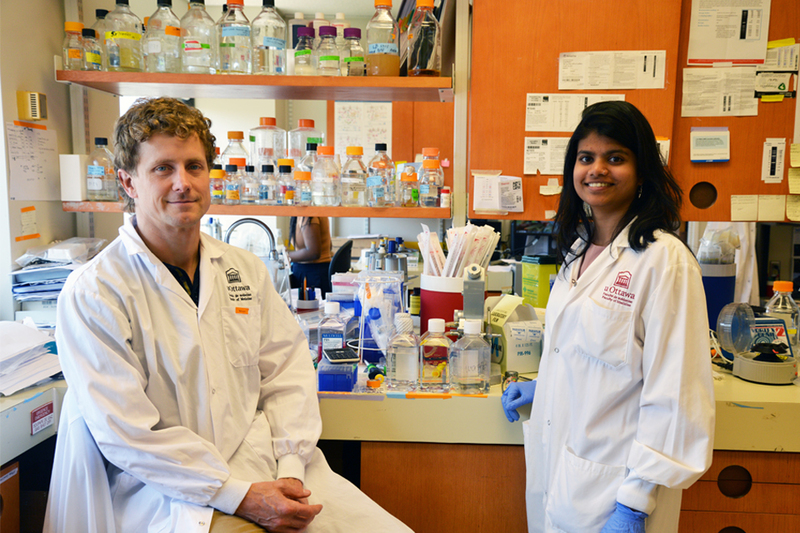 In a paper recently published in Nature Communications, Dr. Gibbings and his PhD student Maneka Chitiprolu, who is first author of the manuscript, share findings which connects multiple genes linked to ALS for the first time in a new pathway that may provide fundamental insights into what causes the disease. In the past few years, we’ve learned that these toxic inclusions in ALS patients resemble in many respects clumps of protein and RNA that cells make when they are stressed, and that are called stress granules. Specifically, the research pinpoints that a series of genes all linked to ALS normally work together to eliminate stress granules through the process of autophagy (self-eating). Their research shows that mutation or loss of any one of these genes, prevents the elimination of these stress granules, which in patients is believed to lead to neurotoxicity which characterizes ALS. Chitiprolu’s research goes on to show that the p62 receptor interacts with one of the most predominant genes implicated in ALS, called C90RF72. The p62 receptor interacts with C90RF72 at the protein level and this interaction is key for eliminating the stress granules. “In a lot of ALS patients, the C90RF72 gene is found to be mutated and we think that this mutation may be mediating the disease in part by the loss of its normal function – that is, its ability to interact with p62 and clear the stress granules,” explains Chitiprolu. Of the approximately 15 genes linked to ALS, patient data reveal that the mutation of any one of them can lead to the disease. Furthermore, the list is not exhaustive as researchers have identified up to 50 genes that may cause ALS, and the list continues to expand with major international initiatives. Along with major funds such as CIHR grants, the ALS Society of Canada partially funded Maneka Chitiprolu’s research on ALS through its donor-supported ALS Canada Research Program. A group of expert peer reviewers recommended Chitiprolu as a recipient of the ALS Canada trainee award. “Since 2005, ALS Canada has provided multi-year trainee awards to the brightest young minds doing great ALS research in labs across the country,” says Dr. David Taylor, Vice-President, Research of the ALS Society of Canada. 90% of ALS cases are called “sporadic”, meaning the cause is environmental or unknown. 10% of cases are genetically inherited. There is currently no cure for ALS. Patients die between two to five years of being diagnosed. Approximately 3,000 Canadians and 30,000 North Americans are currently diagnosed with ALS. Patients’ average age is between 40 to 65 years old. Dr. Derrick Gibbings and PhD student Maneka Chitiprolu.